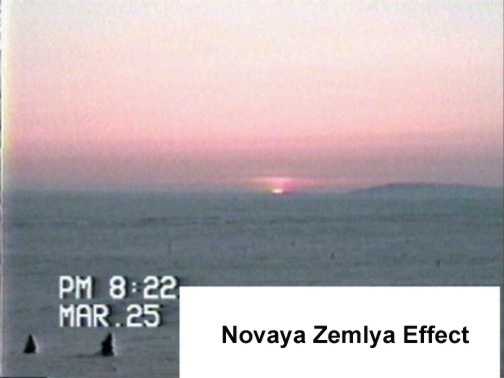 "The prototypical display seen by Barents's men at Novaya Zemlya on 24 Jan. 1597. There is much discussion in Charles T. Beke's introduction to the first (1853) edition (printed here in the second edition on pp. 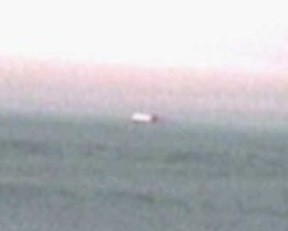 cxliv - clvi), showing that de Veer's observations are reliable. He concludes that "We have therefore no alternative but to receive the facts recorded by de Veer as substantially true, and to believe that owing to the peculiar condition of the atmosphere, there existed an extraordinary refraction, not merely on the 25th of January, but continuously during fourteen days afterwards, at first amounting to nearly four degrees, but gradually decreasing to about one degree and a half." ... "The problem is a curious, and, with our still insufficient knowledge of the laws of atmospheric refraction in high latitudes, a difficult one. Nevertheless we may confidently rely on the result being such as to establish the entire veracity of our Dutch historian." No.54 of the first series of works issued by the Hakluyt Society. First edition edited by Charles T. Beke, 1854; Second edition, with an introduction by Lieutenant Koolemans Beynen, (Royal Netherlands Navy) Gerrit de Veer. The Three Voyages of William Barents to the Arctic Regions (1594, 1595, and 1596) (The Hakluyt Society, London, 1876). the 1876 2nd Ed., by Burt Franklin, 1964, New York. 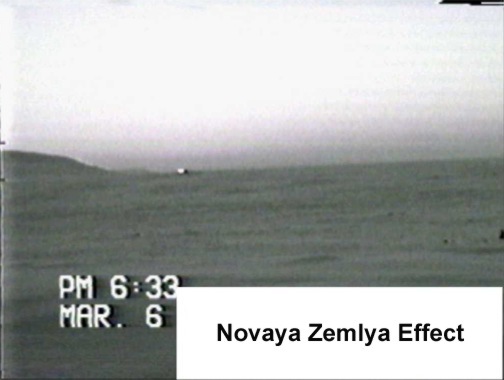 February 5 2001, 1952 UTC. 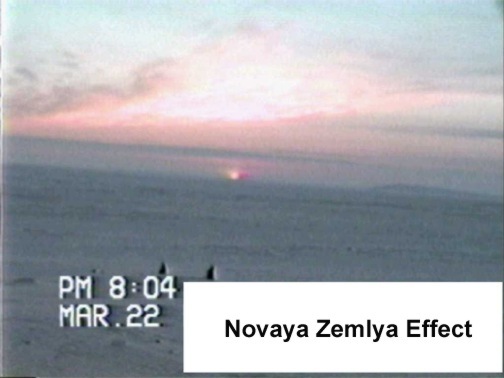 The rectangular sun or the Novaya Zemlya effect. 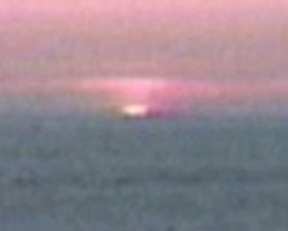 The rectangular phase of the sun was Named by a Dutch explorer in the16th Century. 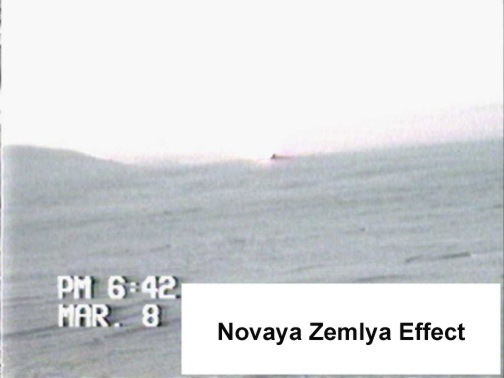 Subsequently it was thought to be "anomalous", infrequent. This is not the case in the high Arctic. 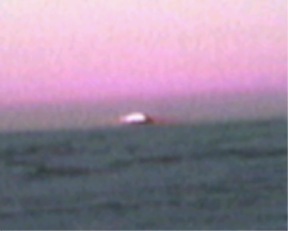 What follows was taken from our videotape files. 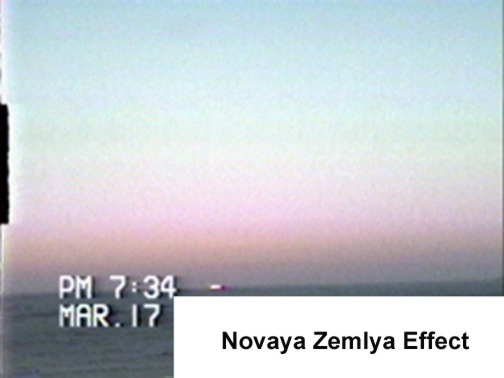 Sometimes the camera froze or there was clouds, but all indications are, in Resolute , Novaya Zemlya effects are a by-daily event from beginning of February until end of April, fall observations are pending. Consistent refraction boosts upwards of 2 degrees was quite expected given that refraction changes with Air mass, and the High Arctic Air remains largely stable and extremely cold during winter. Curiously, many if not all experienced observers and pilots have failed to notice this effect at all, despite years of experience here. 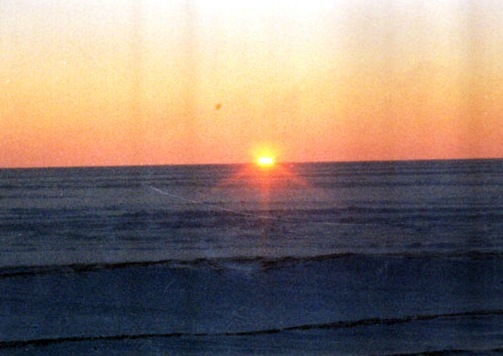 However older Inuit, the aborigines of the Arctic, are quite familiar with the rectangular sun, although none questioned have a name for it. 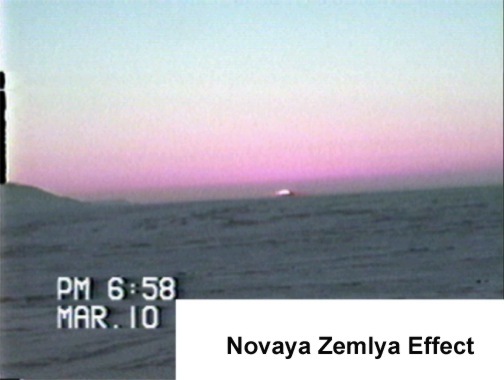 The following pictures are all the Novaya Zemlya effects well captured on tape so far. 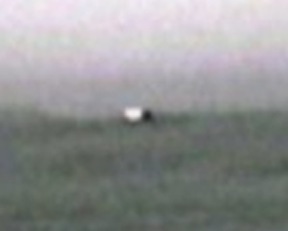 Note, the old video camera often froze, causing a significant drop in picture quality, or no pictures at all. 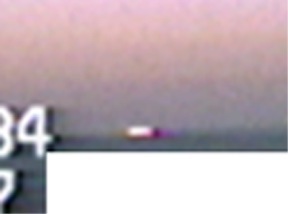 Since the Lower limb is seen on all cases, total refraction boosts are calculated from the bottom of the sun, the different refraction values are random because of the picture selection process. 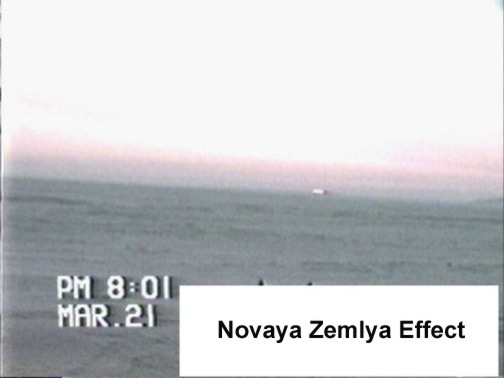 March 21 01:01 UTC; lower limb boost of 2.37;best sequence on record. 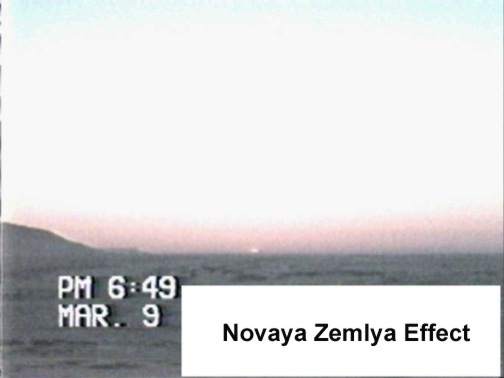 Also not displayed here: the sunset sequence of April 4 and April 23,2001.